Eric Cruz López, an undocumented student who was arrested earlier this month, speaks at a press conference in January. 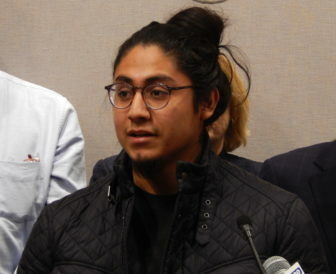 One activist’s arrest has counteracted months of lobbying for a bill that would have allowed undocumented students to receive financial aid at Connecticut’s public colleges. For years, undocumented immigrant activists and allies have pushed for passage of a bill to grant undocumented students access to the $165-million pot of institutional financial aid at public colleges and universities in the state. Undocumented students pay into the pot with their tuition dollars. In each of the past two sessions, the Senate has approved the bill with bipartisan support. The major hurdle has been the House, which, in the past, has not taken up the measure. That was set to change Tuesday. The so-called “Dreamers” – advocates of the legislation – held a press conference last week with two Republicans who had come out in support of the bill. A third Republican later pledged to vote for it as well. This appeared to breathe new life into legislation that House Speaker Joe Aresimowicz, D-Berlin, previously said did not have enough Democratic votes to pass. He told reporters that, after the press conference with the Republicans, he had begun preparing to bring it onto the floor for a vote. But as legislators returned from a long weekend Tuesday morning, it became clear the bill had lost critical support with the news that a leading activist backing it had been arrested. By the end of the day, Aresimowicz decided to withdraw it. Eric Cruz López, an undocumented immigrant and a former student at the University of Connecticut, had been arrested and charged with 103 counts of criminal mischief. His arrest became public several hours after the press conference last week, when the Hartford Courant published a story on his arraignment. A months-long police investigation found he had committed acts of vandalism at UConn’s Storrs campus, which included painting the phrase “F— Trump” on buildings and signing the sites of the vandalism with the moniker, “Pest.” Cruz López told police he committed the acts. He was arrested on May 7, but media outlets did not become aware of it until he was arraigned on May 18. Lawmakers on both sides of the aisle singled out Cruz López’s arrest as the reason the bill lost crucial support. Cruz López did not respond to requests for comment Wednesday afternoon. Rep. Pam Staneski, R-Milford, one of the three Republicans who had planned to vote for the bill, said his arrest was “the impetus for valid concerns” that arose in the Republican caucus. The other Republicans who had announced support for the bill were Rep. Timothy LeGeyt of Canton and Rep. Livvy Floren of Greenwich. Staneski said she was ready to “chalk it up to youth” – until her phone “blew up” with texts from her colleagues. She said her phone blew up again Monday when the bill was added to the list of those heading to the floor for a vote. Between Friday and Tuesday, she said, she had “numerous” conversations with other House Republicans. “At this point, I need to support the concerns that my caucus has and seek to get the answers to those concerns,” Staneski said. Sen. Beth Bye talks with Dreamers outside the Senate chamber. Aresimowicz said the Republicans’ decision to withdraw support for the bill changed the dynamic. Staneski scoffed at the idea of placing blame on the minority party for a bill backed predominantly by members of the majority party. Leaders in Connecticut Students for a Dream – the chief advocacy group run by the Dreamers – have been scrambling to get back on message amid the fallout from Cruz López’s arrest. They say they did not have any time to prepare for the news. Lucas Codognolla, the group’s executive director, said Cruz López did not inform them of his arrest when it happened earlier in the month. Cruz López even attended the press conference with the Republicans pledging their support last week. Their efforts to save the bill in the House proved to be too little, too late. After the House adjourned without taking up the bill Tuesday, Codognolla sent a letter to all legislators that disavowed Cruz López’s actions. “We are disheartened by the public perception this incident has caused and how it has made it more difficult for many to support an effort that we have been working for many years toward,” Codognolla wrote in the letter. The group is now making a last-ditch effort to get the bill on track, pushing for the Senate to pass it for the third straight year. 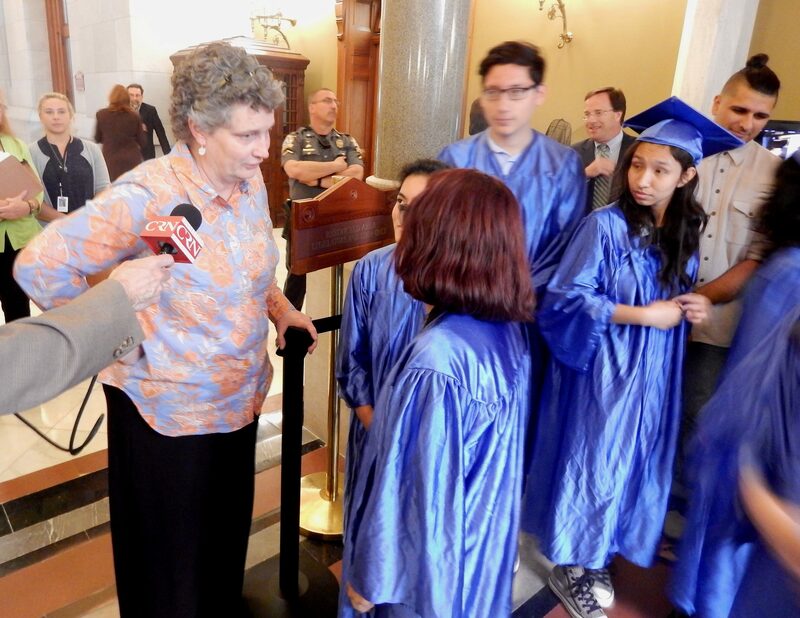 About a dozen Dreamers wore blue graduation caps and gowns outside the Senate chamber Wednesday and talked with legislators who passed by as part of their lobbying effort. Carolina Bortolleto, a spokeswoman for the group, said the bill would open Connecticut’s public colleges to more prospective students by making them more affordable, which could offset declining enrollment and help stabilize falling revenues. The bill has the support of both University of Connecticut President Susan Herbst and Connecticut State Colleges and Universities President Mark Ojakian.